I fell in love with this organization called NESU already a little over two years ago. It was my first autumn at the University of Tampere when the older students asked me and my friends to go to the NESU cruise to Turku right after our very first sitzparty. We decided to go and it was an excellent decision because I still remember how much fun we had and how many new people I met only in one day. During that autumn semester we traveled many times with my loyal friend Annika to Turku, Lappeenranta, Pori and Mikkeli. In late November I applied to NESU-Boomi’s board 2017 and made it there. Now after two years in NESU-Boomi’s board and dozens of sitzparties almost in every NESU city later I could say that I don’t regret my choice I made when I was a freshman. Being the chairperson of my own NESU organization has been very educational and useful for the future challenges in working life. Also being the project coordinator of NESU Finland this year has already taught me a lot about team work and has given me new information about the whole organization. The best trips to the other NESU-cities have been the spontaneous ones, when me and a couple of my friends have got the idea of going to the sitzparty only a few hours before the party. Once I remember being on a Spanish lesson trying to concentrate but then received a text from my dear friend Santeri: ”I bought us bus tickets to Pori! The bus leaves in an hour! ” I was so confused but also very excited. I didn’t have to think more than three seconds if I was going to Pori or not. So I ran home to pick my overalls and then headed to the bus station. When we arrived in Pori, we felt so welcomed at the Pre-Chirstmas sitzparty. We enjoyed the sitzparty a lot and danced till dawn at the club because we had to wait for the bus that left at 6 am. When we got back to Tampere, we went our homes to have a nap before Boomi’s Pre-Christmas party. 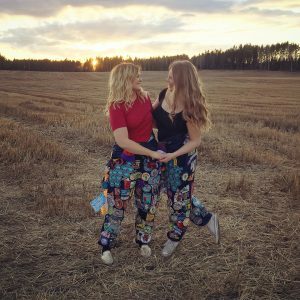 Another memorable story is from Kuopio, where we decided to go spontaneously with my very best friend Aino. We were both listening to a boring lecture and haven’t been to any sitzparty for a while so we were searching for one to go from nesu.net. We were so happy to find out that there was one in Kuopio that night so we just texted our friends there that answered that ”you were lucky, there were two last minute cancellations so you are more than welcome to join us tonight!” Then we jumped on a bus and travelled around 4 hours to get there. The sitzparty was so crazy and we fell in love with NESU-Preemio and the way they party in Kuopio! When it comes to my very best memory of NESU, it would be last year’s NESU Autumn Conference in Lappeenranta and Tallinn. It was my first NESU Conference and we decided to go there together with my really good friends from NESU-Boomi. When the week started, I got to know a lot of people already at the cottage in Lappeenranta and the feeling of belonging together with all the nesuits in the Conference just got stronger and stronger every day. During the day program, I learned a lot about value creation with technology and in the evenings we had so much fun with fellow nesuits in different kinds of activities. The gala night in the end of the Conference was probably one of the best nights of my life, full of laughter and happy people around me. When I got back home, I felt empty inside and missed all the amazing people I had met during the week. All in all, I could say I have had the best time of my life while organizing and participating in NESU events. Each and every nesuit I have met during the sitzparties and the Conference have been so friendly. There’s something in common in everyone who this organization gathers together. We are all social, kind, open minded and ready to help each other. I think it is the thing called NESU spirit. And that’s why I keep on going to meet these people to different cities around the country. If you would like to share your own story about NESU, please contact me or other board members of NESU Finland. We are very excited to hear more!